Welcome to the online headquarters of the World Carfree Network, the hub of the global carfree movement. Worldcarfree.net is a clearinghouse of information from around the world on how to revitalise our towns and cities and create a sustainable future. In addition to serving the carfree movement, Worldcarfree.net offers resources for architects, planners, teachers/professors, students, decision-makers and engaged citizens. Our monthly e-mail bulletin has a new look! Click here to sign up and browse the archive. The tenth TCC conference will be held in Guadalajara, Mexico, from 5 to 9 September 2011. Click here for more information. 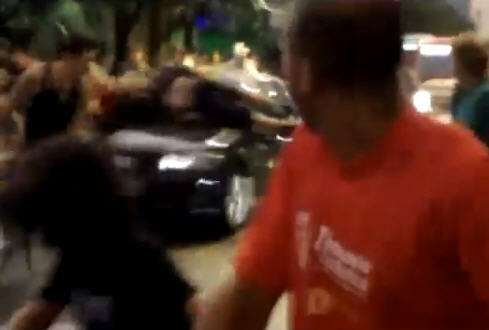 Participants on a recent critical mass cycle ride in Porto Alegre, Brazil, were attacked by a motorist who ploughed straight into the crowd. Click here for more information, WCN's statement and how to respond. The new and beautiful Carbusters website is online now! Read, comment on and enjoy the magazine of the carfree movement. Support WCN and the Carfree Cause! The global economic recession has hit the WCN hard making it very difficult for us to keep our projects running. If you have it in you to support the the WCN carfree projects, now is the time. The Carfree Cookbook is jam packed with inspirational action reports, how-to-guides, media outreach handbooks and carfree graphics, together with a way to get in touch with other activists and to publish your own actions and share your skills with the carfree community. It�s everything you need to become a carfree activist! World Carfree Network Europe o.s. has been funded with support from the European Commission. Worldcarfree.net reflects the views only of the authors, and the Commission cannot be held responsible for any use which may be made of the information contained therein.